Prototype photos I have taken over the past year. Prefix # 29- G SCALE email for prices. I do not accept credit cards or pay pal. Overseas orders add $6.00 for p&h. Please keep in mind that Charlie won't have the decals in stock, he will order from me by email. Then he should have them in a week. Please order at least 20 decals from SHOW ME MODEL RAILROAD COMPANY. Illustrated HO, N, O AND S scale catalog. Illustrated catalog $10.00 plus $5.00 for P&H. Buy the catalog once, then every 3 months, send a LSSAE for updates. Fits in a 3 ring binder. Hobby Dealers - Distributors interested in my line of decals, please send me your address on your company letterhead. Then I will send you all the information that you need to get started selling my decals. On mail orders, please allow 2 to 4 weeks to process orders. I try to process mail orders in the order I recieve them. I do everything by myself. I do this because I have to wait for checks to clear the bank. I also create my own artwork, printing, packaging, and mailing to other hobby shops & distributors. This all takes time. Also the N, S, O & G scale decals are not in stock. I print them per mail order. The only decals that are in stock are the HO scale decals. If you can't wait for your order, email me and I'll gladly give you a refund! Here is my handy dandy order form. If you don't have a printer. Just fill out the order on a blank sheet of paper and add $1.75 for p&h. Overseas orders, $6.00. Also please add your email address on the order form in case I need to contact you. N Scale sets will letter 3 cars. Some of the HO sets will letter 2 cars, most only letter 1 car. Some of the S & O scale sets will letter 2 cars, most only letter one car. All decals sets have a number jargle. Now if you don't completly understand anything above, email me and I'll try to explain it to you. It is very easy to understand. Scan with permission from Kadee. Visit the Atchison Rail Museum. I'm also a member. as it might cause the decal not to release from the paper. I do not make custom decals, so please go to Rail Graphics. As I am a manufacture of decals, I can not have people come an purchase decals from me in person. You will have to mail order the decals or order them from your favorite hobby store. Thanks for understanding. All decals sales are final. Please no returns, unless I approve it. I will replace decals if there is a defect or the decal has gone bad, this does happen. Thanks for understanding. If it gets damage in the mail. I will not replace it. Seems like the damn mailing machines like to tranfer the lettering to the plactic bag. If this happens, PLEASE send a LSSAE for the replacements. All railroad heralds & logos are trade marks of the railroads. All railroad heralds, trade marks & logos used with permission. You must get permission from the railroads before using their trade marks, heralds & logos for anything. Check out this link for some good line drawings of fallen flag roads!! Please check back ever so often, as I'll adding more! and resized. They do not have to have my decals on it. Oddballs Decals produces decals using Alps MD series Printers. If you have a question about what I have in stock, please email me before ordering. Some of the sets (below set #100) I have to remake the artwork. Want to learn more about MoPac Modeling? How to Contact me here at Oddballs Decals. located only 2 miles west of Union Station. Here you will see lots of trains. Kansas City Southern, Union Pacific, Burlington Northern Santa Fe, ICE and Amtrak. This is where I railfan most of the time. I'm down here almost every Sunday afternoon between 12pm & 2pm. Just look for a 2007 Toyota extended cab dark blue pickup truck. I'll be setting in the parking lot next to the Homes drywall plant. Bad news everyone, KCT has put up no trasspassings signs in the area, you will be prosecuted!! This took effect last Monday the 10th of Feb. 2004. So if you railfan this spot, stay on public property and public streets. Aerial photos of Santa Fe Junction. Santa Fe Junction is located in the center of the map below. As most of you know, I like the Missouri Pacific railroad. What if the Missouri Pacific was still going today. Missouri Pacific Dream Scheme photo 1. Missouri Pacific Dream Scheme photo 2. My friend Gary Rose from Oz did these for me. Missouri Pacific Dream Scheme photo 3. Automax autoracks - HO & N scale only. $8.25 each. N scale $5.50 each. Yes, they come with the air holes for the cars. 694 Home Shop For Repairs Do Not Load (present) Set has 126 signs. http://www.sunrisenterprises.com/ is where you get the station sign pole. See some names that I don't have, email me a list so I can add more. Buffalo & Pittsburg Railroad Inc.
592 ACF 2 bay covered hopper (7-68) Detail Associates/Ramax kit. Not Intermountain as on the drawing. 586 41' ballast car (10-72) Set will letter 2 cars. 140 1 bay airslide 3 color herald (1965) HO & N scale $7.00. S & O scale $12.25. The above set will now letter 2 cars. One in the gray paint, black letters. One in the silver paint, yellow letters. 290 CGW heralds - 36" will letter 15 cars. 389 45' Van trailer. normal letters. 3 color herald. 390 45' Van trailer. bold letters. 3 color herald. 316 CNW quad panel sand hopper (3-65) (1 sheet white/ 1 sheet black) HO & N scale $7.00. S & O scale $12.25. 392 50' ext. post boxcar (6-77) painted CNW yellow not Zito yellow as the picture says. 627 David J. Joseph new logos. (2000) white & green graphics. 26 logos per set. 563 Farmall H or M Tractor (1951) HO SCALE ONLY Set will letter 8 tractors. There is an article in Model Railroader July 2002 issue by Trevor Marshall on these tractors. 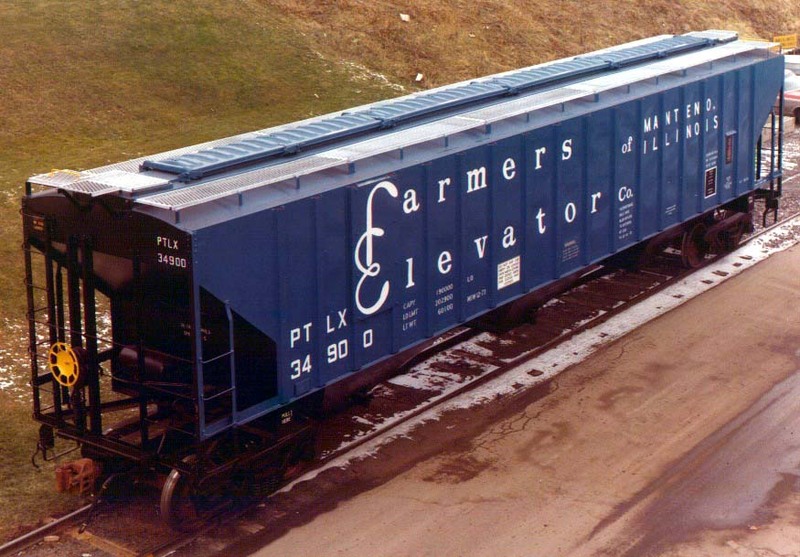 Finger Lakes Railway Company, Inc.
8 GP40's large KCS Letters. 13 60' & 40' tank cars. Painted bright red. BACK IN STOCK. Will letter one of each car. 309 12" letters & numbers, white & black. HO & N scale $7.00. S & O scale $12.25. 382 MKT 30 inch KATY heralds. 32 per sheet. 395 hood units & f units (57-65) Deramus era. 715 40 & 48 inch MKT heralds. 9 of each size on a sheet. 734 24 inch MKT heralds, 50 per sheet. Use for gp-7's,rs-3's and as16's in the pre Deramus time frame. UP licensed product 1A assorted white heralds, numbers, reporting marks. HO & N scale $7.00. S & O scale $12.25. 1B assorted black heralds, numbers, reporting marks. HO & N scale $7.00. S & O scale $13.25. 178 passenger cars names & numbers.HO & N scale $9.00. S & O scale $16.50, printed in silver ink. 284 Wood or steel caboose (30-60) painted boxcar red. 484 2 bay airslide. (6-94) up 3 color herald. 486 PS2-CD covered grain hopper (3-99) up 3 color herald. 538 69' wood chip hopper car (1-81) Walthers kit. 572 Missouri Pacific Lines 2 color, red & white assorted heralds. 675 Speed Restriction Sign Numbers, all eras You'll have to make your own sign post. 967 3 bay covered hopper. hoppers and ends painted black. 579 CGRX 3 bay covered hopper (6-00) 5461 cuft. CSYX - Central Soya Company Inc.
FGDA - PTLX Private Grain Car. General Electric Rail Services Corp.
724 4 bay plastic pellets covered hopper (9-91) This set also includes in GPLX reporting marks. 626 50' tank car (7-98) set will letter one car. Prototype photo. Photo from Mike Rose. 292 heavyweight passenger cars printed in gold. South East Kansas - South Kansas & Oklahoma - All on one set. Will letter 1 of each engine. HO & N scale $7.00. S & O scale $12.25. Set number 503. SOUTHERN RAILWAY OF BRITISH COLUMBIA, LTD.
180 Black hood units yellow striping & letters. Letters at least 4 units. HO scale $9.25, N scale $7.00. S & O scale $15.50. Also has the lettering for the Quanah Acme & Pacific units. 312 Frisco steam engines, gold letters & numbers. HO & N scale $9.25. S & O scale $14.50.Set will letter 2 engines. 317 Frisco steam engines, white letters & numbers. HO & N scale $7.00. S & O scale $12.25. Set will letter 2 engines. 726 transfer caboose. White and black lettering. Set will do two cabooses. 727 Motor car. (1940's) $6.25 N & HO scale. $7.25 S & O scale.Set will letter 2 cars. 731 red, white & blue caboose. Set will letter 3 caboose. $8.25 N & HO scale, $14.25 S & O scale. 732 42' steel gondola, (blt 9-19) set will letter 2 gons. 733 42' panel side gondola,(6-36) set will letter 2 gons. and FP-7s, one of each in the set. The below Gif images use with permission from Rick Johnson/Soo Line Historical and Technical Society. The sets below have the same number series, just different paint schemes. Numbers 70151-70249, odd numbers only. 342 PS2CD hopper (7-85) Painted off white. 515 PS2CD hopper (2-74) Painted off white. 516 PS2CD hopper (2-76) Painted off white. 517 PS2CD hopper (9-64) Painted light grey. 518 PS2CD hopper (8-78) Painted off white. 303 ballast car (2-78) The below sets are the same, just a different picture of the car. 361 26' ore car (5-58) set will letter 2 cars. 361 26' ore car (4-62) set will letter 2 cars. 42 50' FMC single door box (1992). 520 Wings. (2000) use on the front of the units. SD70m & AC4400. 629 Wings for the hood units. Use on the front of the units. (2001) GP-40's, GP-38's. etc. 762 ARMN rebuilt mec. ref. (4-03) set will letter one car. 842 - 28 foot van trailer. Set will letter 4 trailers. (1947+) $8.50 HO scale, $5.00 N scale, $15.50 S & O scale.